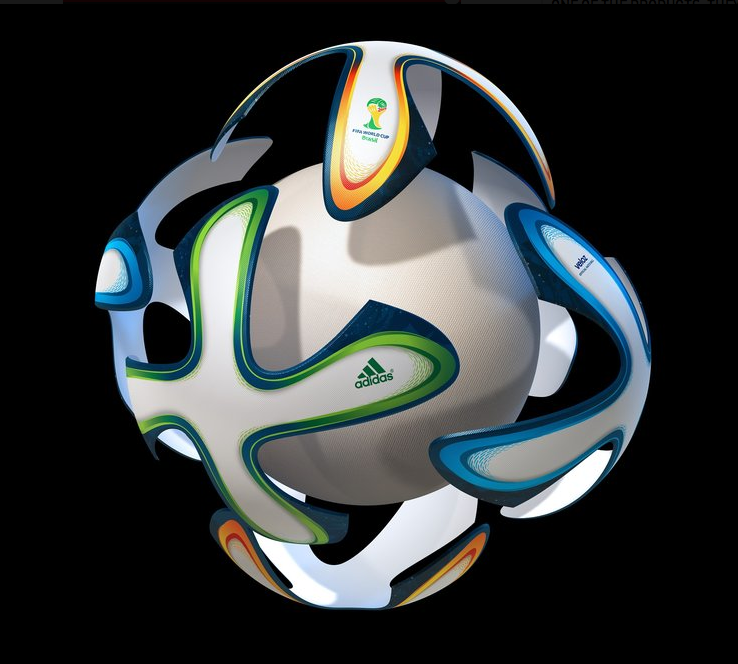 Brazuca Adidas game ball, but imagine this shape was made by Nature how might the shape be determined? In other words if evolution could produce a Brazuca as a plant how might the design logic look like ? What kind of genetic code could produce a Brazuca shape say in a plant, like some ripe fruit ready to pick ? There’s only one answer: tensegritry code. Let’s pretend there is an embryo type sequence for assembling the shape of a soccer sphere. Lets also assume there exists a design code to define this process just like we’re building a human being from an embryo what are the basics to accomplish ? 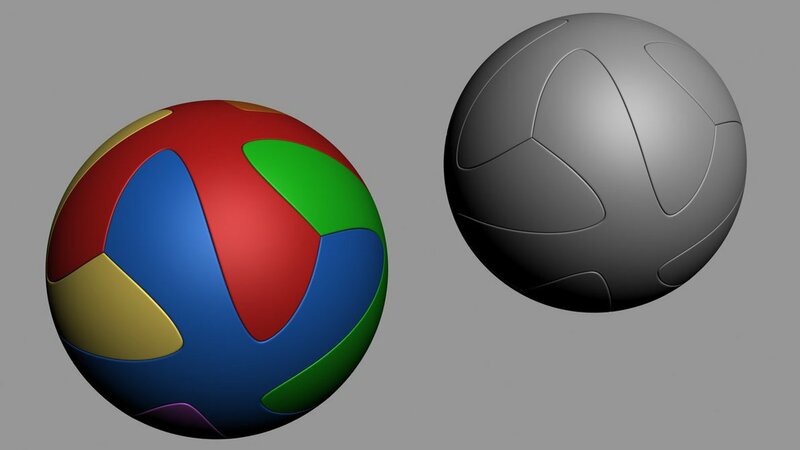 Could the separate cells be created to unite into the surface to surround a soccer ball dimensional volume ? If we placed such an imaginary shape into an Magnetic Resonance Scanner what type of image wizard manipulations might we perform to examine the inside of the shape ? Another sphere exists inside, what is the purpose of this inner sphere ? But what about the genotype to prototype could we encode such a such assembling by itself rather than the human hands that are the machines that create the Brazuca ? Could we 3D print a Brazuca ball ? Lets see what kind of design code we might need to make a soccer shape. But what of the original Buckminister Fuller ‘Buckyball’ wasn’t that shape the optimal design? But lets look at the beginning. 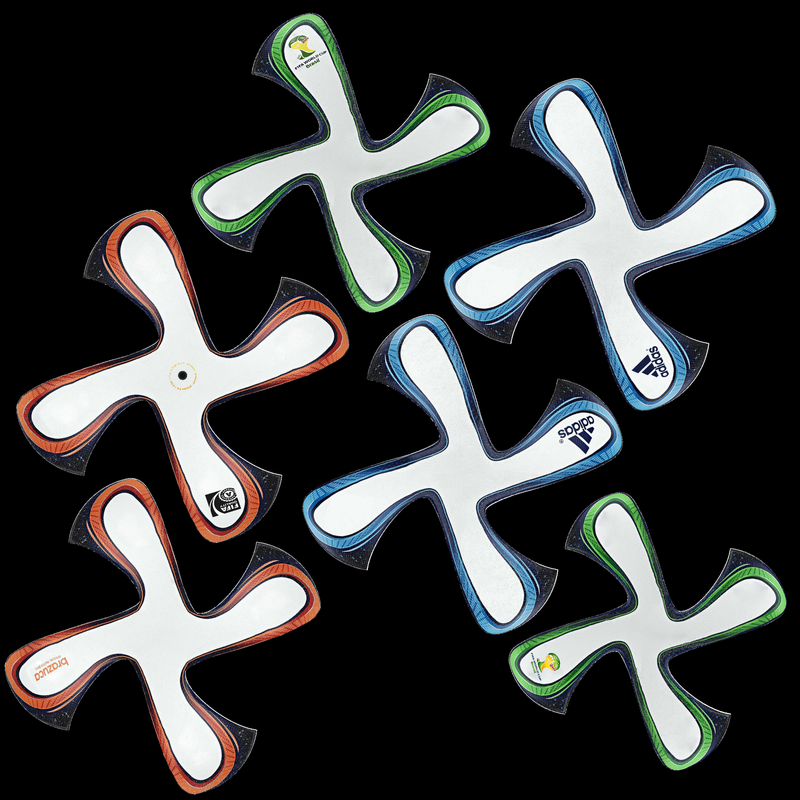 At first Brazuca stars as a sheet with the pattern algorithms to create the panels from something flat into something round. But what is the real necessity for a Brazuca to function ? 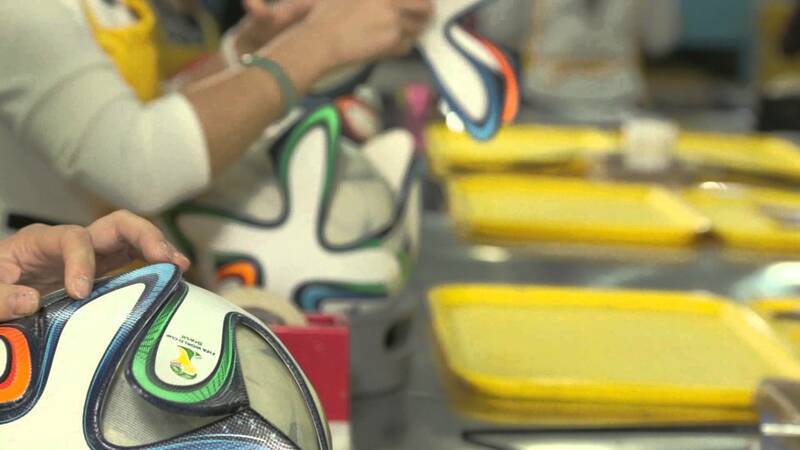 First you need air pressure to give tension inside the Brazuca. You need to sustain the tension with the balance along the seams of compression at the edges of the panels. 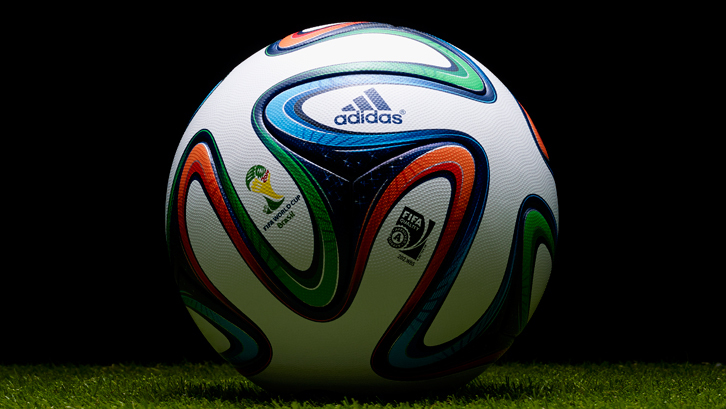 The Brazuca is as if mimicking a tensegrity shape object once it reaches final assembly. And you need gravity to allow the ball to arc high spinning to traverse across soaring over the field in a majestic trace of motion. 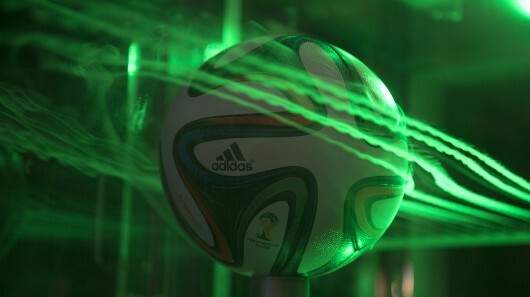 Brazuca perform as a gravity ball. But Nature already builds something similar. 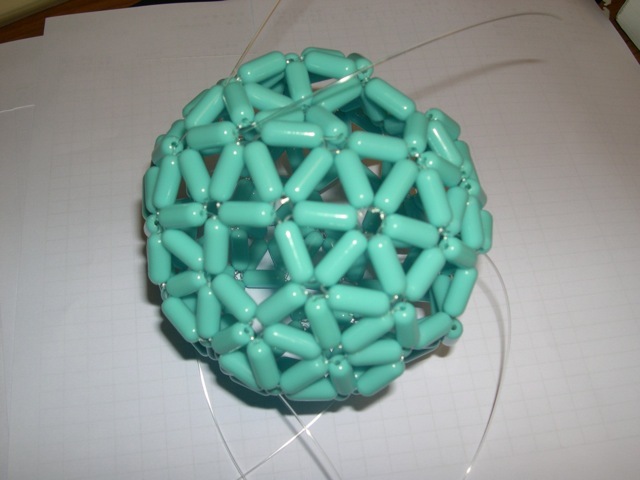 This model of a boron cluster cage with 80 molecules of boron, the shape is termed a fullerene boron Buckyball. Remember tensegrity can scale down in terms of dimensions. Scale down scale up. The buckyball is the form of a geodesic dome which is a tensegrity structure. Just like an older soccer ball but scaled to the size of carbon atoms. Shape is at the core of Nature. Shape is contained in building code in order to perform from sheet surfaces to become components of form that metamorphose into a volume. But volumes at nano levels are determined by bond angles and separation distances into clusters. The optimal shape is the atomic cage a nanodome. On a more human scale of architectural shape we have the geodesic dome. 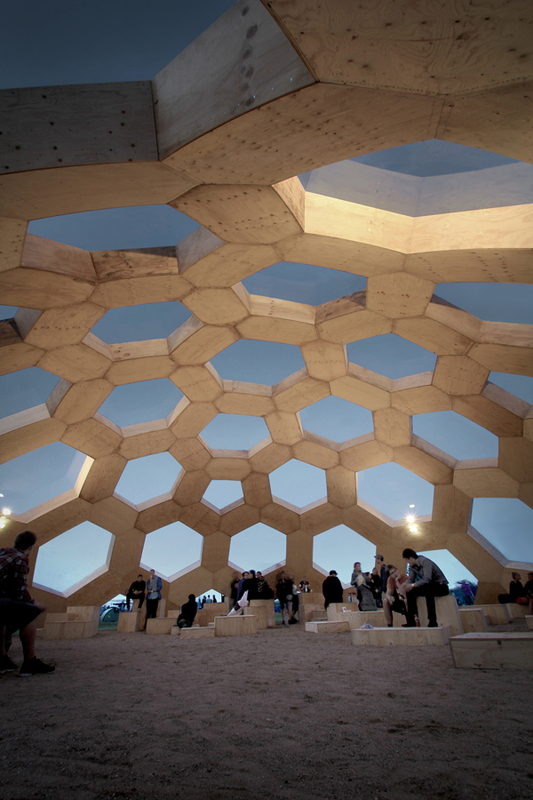 A geodesic dome, like the design created by Kristoffer Teijlgaard and Benny Jepsen at the Danish music festival, Roskilde Festival in 2012, reveals a construction that optimizes the use of resources to a hight degree, by imitating Natures own methods. Mimicking the molecular structure found in one given family from carbon molecules, the matrix is essentially copied when constructing geodesic domes. The tensegrity structure allows for great strength and stability while spanning over large-sized spaces in using a minimum of building materials as well as reduced energy consumption to be used for heating because of the minimal surface and aerodynamic form of the dome. The geodesic method of building, is a method as fundamental as the rectangular method we mainly use today, hence the two methods ought to be considered of equal standing. But what of those tensegrity cells joining together ? Inside as the embryo forms the human sequence morphs into tensegrity webs expanding in all directions. The web net is also capable of communicating within the shape itself. As the shape changes the information flows that is the incredible message beneath the surface of a Brazuca design if Nature had performed the anatomy. The aerodynamic surface not only resists the wind it senses the wind to change its own spin sensing the gravity surrounding it. The point I am making here is that cluster accommodation between boron metal centers resolves into shapes determined by the nano attractive forces that are within the bond balance shape. Shape is the imperative for creating the architecture within Nature. 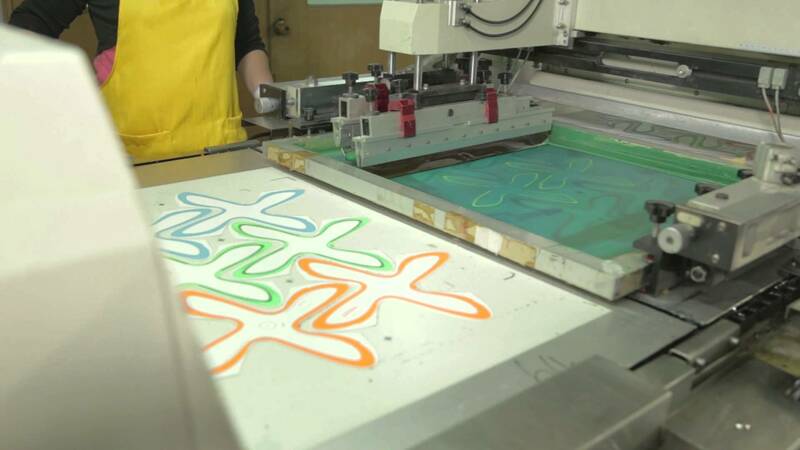 Shape is both design and communication and intelligence capable of sensing itself as shape sensing. Shape links the past shape from evolution to develop shape in the present as a shape sensing tensegrity based body/brain net. Design and build a tensegrity robot without any base plates that is capable of locomotion in at least one direction across a surface. Use of a tether for controls is acceptable. The final robot should be a spinal model, similar Flemons’s Tetrahedral Vertebral Mast turned on its side, with at least three vertebrae and will likely achieve motion by slithering, similar to an inch-worm or snake. A means of one-way friction at the contact points will need to be employed, allowing the robot to slip in one direction while sticking in another to achieve this motion. The actuation of this robot must be by controlling tendon lengths, and not rod lengths. The controlled input should be forces rather than lengths or positions of nodes. This will require force sensing to be integrated. Actuators should be in line with the tendon they control. There should not be a need for the actuator to be fixed to a solid structure. The key areas of focus for this project should be the actuator selection, force sensing, closed loop controls, and design of the motion control. It will likely require custom actuators to be designed and fabricated by the senior design team. While moving, the forces in the controlled tendons must be recorded and displayed to the user. Software must be well structured, documented, and commented for further use in ongoing research. Hardware should be clean, professional and robust, and any instruction manuals for operation must be included. Tensegrity or tension integrity is a structural design that has members put in pure compression by members in pure tension such as tensile tendons or cables. It has no moments or shear in the entire structure making it have a high strength to weight ratio. Tensegrity was biologically inspired by the muscles and tendons that every person has in their own body. Muscles and tendons are in a continuous tension network just like the tensegrity model is based from. Tensegrity is a very efficient structure because of its compactable abilities and lightweight tendencies. By relieving the stress in the tensile members, the structure will lose its support and collapse into a small and compact pile of column members. In addition, by adjusting the tension in any of the tensile members, the shape of the structure can be altered, yet still retain its strength as a structure. This provides great structural versatility and with the forces being evenly distributed among each individual member, it has very high strength capabilities, thus reducing the overall weight. These are all highly desirable qualities for exploratory robotics for NASA, enabling high mobility with a low weight cost, as well as uses in search and rescue. 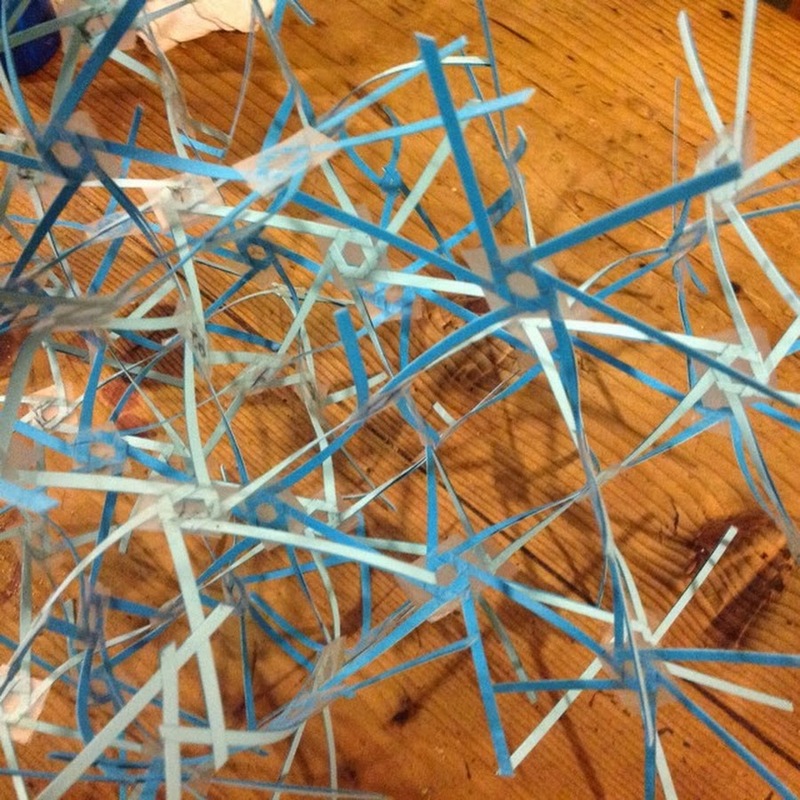 In addition, a tensegrity structure would allow the study of biological uses and analogies. By studying a tensegrity structure, a better understanding of those same biological aspects can be observed and explained. But tensegrity is not only structure the relevance is that shape is transported into code which means transmission in a genetic fashion. Code is the language of the mathematics of tensegrity shape. Configurations can move without elaborate control mechanisms for NASA robots rolling about various planetary surfaces. Tensegrity in Nature is at the core of shape like DNA or RNA. The origami of shapes that change outcome since the shape becomes the sensing apparatus itself. I would term such soft shape characteristics within our own brain tissue web networks. Soft tensegrity is also applicable to muscles and even bone since they both can sense the motion either with gravity or without gravity. Hence tensegrity will be found throughout our own Galaxy dispersed into the Milky Way. 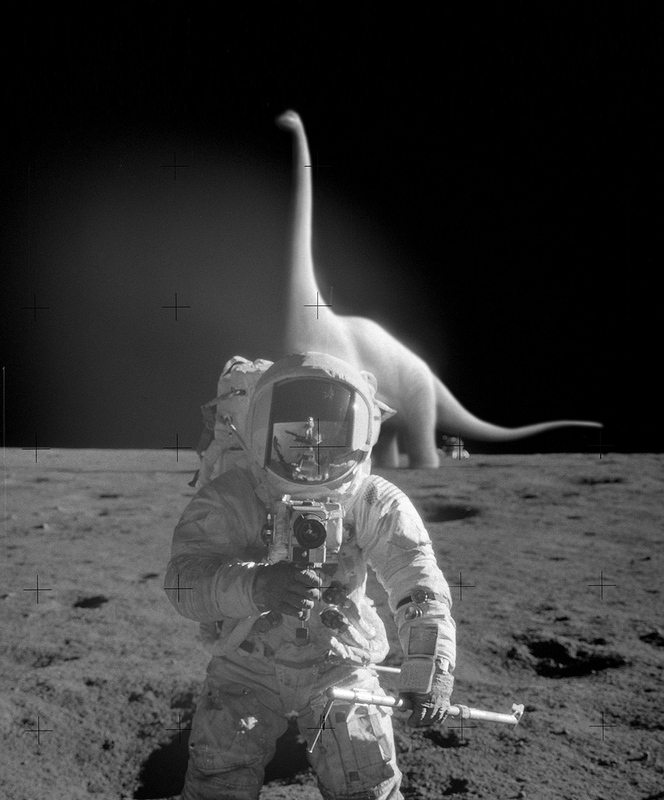 As a astronaut stands on the moon and scoops his hand into the regolith material on the Lunar surface the same shape of otoconia crystals held in his gloved hand that exists as sensing accelerometers in his own vestibular apparatus the saccule. Shape is inside in the domain of scaled messengers acting at the moment of self awareness. Shape is stirred under the very surface we stride over on our outward journey of life. Shape unites our own design into the coherence of the worlds surrounding us. 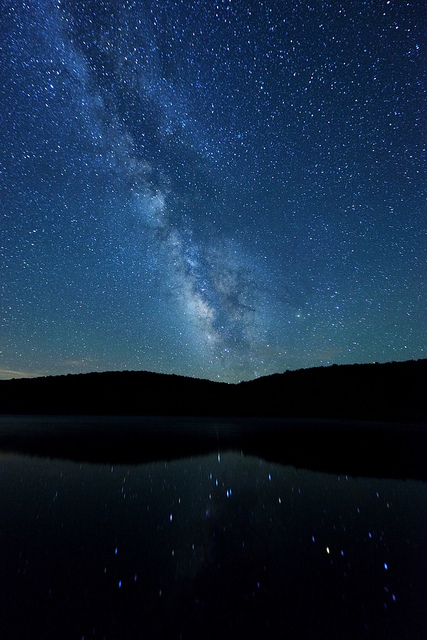 Shape is the precious link of Nature over our heads in the night sky into the very recesses of our oun mind apparatus. Shape is the connection web into Nature.